Welcome parents and students to the 3rd grade here at Yocum Elementary. We look forward to an awesome year. We will be focusing on the following academics this year. The 3rd grade teachers are so excited for this year! In 3rd grade we focus on Narrative writing. Specifically, students are taught how to write a personal narratives. The students will write a story about their life that fits a specific purpose. Third grade is a BIG year in STEM (Science, Technology, Engineering, and Math) at Yocum! 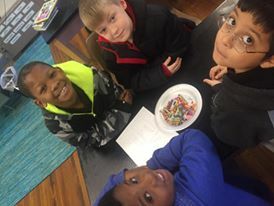 We are applying our reading skills to learn more about weather and climate, the impact and traits animal and plant life cycles, and engage these topics in work on developing and building our 21st century career skills of cooperation, communication, critical thinking and creativity in engineering is a cornerstone sill we aim to ace in 3rd grade. We have serious amount of fun while we do all of the serious learning! Third grade Reading classes this year will be focused on Shared Reading is a time when the teacher reads a book or passage and teaches a skill from that text. All students can see what the teacher is reading either by having the text in their hands or by having the text in their hands or by having it displayed on the TV screen. Guided Reading groups will be taught and students are placed in a group based on their current reading level; Our goal in both of these times is to increase students' reading levels!